Club Penguin Cheats by Mimo777 Club Penguin Cheats by Mimo777: Club Penguin Series 10 Treasure Book! army70345 here,ur welcome i will help u any time! Yeah. I was really annoyed when a few treasure books ago I found out that they were bringing back rare items. If they ever put the gold viking hat in there, I might even cry. How do you unlock things in the treasure books? What exactly are treasure books? hi! in the news it says that soon black puffles cart surfers, they are getting lots of puffle games: cart surfer, catching waves, aqua graber, jetpack adventure, dance contest, i wouldn't be suprised if they make a game for every puffle, like a skating game for the white puffle, or ice fishing (maybe blue). oh my gawd! water dojo and cards and stuff is cominz out in november! even check new toys! cant wait! ya i rasly whant that hat i hope i get it becaue my bdays on sater day! ahhhh really?? they put the really really really rare gold viking helment in it ahhhh really??? i have it my penguin is over 1000 days old sooo its not that rare now!! That's great! I can't wait when that'll be out. I really hope they DO have a skating game..or atleast a new game to play. I love your opinion, and I totally agree. Does anybody else recognize the leather pilots jacket from the festival of flight catalog? real cool! (its lukey115 again) ive always wanted a series 3 code but now the series ten looks way coller than the others! i cant wait to get the series ten code! 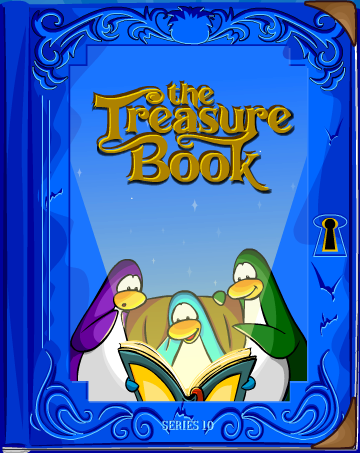 id say some of the treasure books have items that were in the game like the long johns, they were in december catalogs but the only rarest item i know is the puffle flame hoodie! waddle on! First of all! I forgot my password, and thats why im Anonumous.I LOVE YOUR COMMENTS! And tomorrows my birthday! Soo thanks for telling the whole cp world about this! And i really wanna tell you my penguin is Purple88888 in case you see my as your parties! does anyone know how to get the 5000 shoot the tube stamp on catching waves? I've been trying on freestyle, but I'm always running out of time. are series ten items in stores yet? if you get like a puffle keychain its not a series right? it always just puts you in the newest series right? and the same with the puffle plush toys right? so if i get a keychain, since the series ten aren't in stores yet i think..... it will let you unlock from the series 10 right? please answer!! The new treasure book looks awesome. Also if you have nothing to post I found out that you can now get cp toys at Big W in Australia! Its good cause you used to have to go to kmart. I reckon the "Dark Chamber" Will be like the medival party quest. I hope you get prizes like you did in that one!! Mimo, have you noticed that the Clip On Puffles codes always move up to the newest series? I think it's interesting.